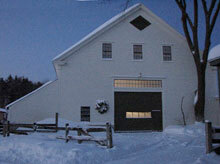 The house and main barn were built in 1811. We have 14 stalls, and 9 run-in sheds. The stalls are 12 x 12 or bigger; all have rubber mats. 3 tack rooms are available for client’s tack, equipment, and blankets. The indoor arena was built in 1989. It is 70 x 150, well lit, snug and cozy in the winter, with a heated viewing room on one side, and an elevated deck with lots of seating on the other. Visitors, students, and parents of young riders are invited to watch lessons in progress, or the trainers at work. We have excellent footing, a custom mix of sand and rubber, which is groomed every day. There are 14 paddocks that are used year-round, high and dry with heated, automatic Nelson waterers. The paddocks are of various sizes for individual or group turn-out. 7 grass pastures are available for summer turn-out and grazing. Each one is 2-3 acres in size. The outdoor riding arena is 100 X 200, with well-drained sand footing. A full size, regulation dressage arena, with letters, is often set-up in this arena. All of the facilities mentioned above are completely enclosed in wood fencing. A beautiful network of trails runs through our fields and woods. Many are along side of a large brook that runs across one end of the property. All our trails have good footing. All of our operations are run in accordance with “Best Management Practices” in cooperation with the USDA Natural Resources Conservation Service, and the Cumberland County Soil and Water Conservation District.